The Ambu Man is an adult sized training manikin that provides an expectionally lifelike representation of the human anatomy. Features: Ambu's unique hygienic system protects the student from cross-infection, makes internal cleaning entirely unnecessary and facilitates the look-listen-feel concept. 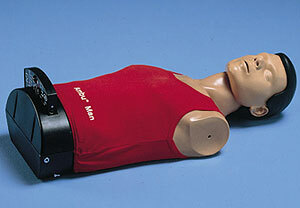 The stiffness of the chest is adjustable, allowing students to train on different body builds Airways open only when head is correctly hyperextended A carotid pulse can be activated manually by the instructor A carotid pulse is also activated during correct chest compressions The mechanical monitoring instrument gives you instant feedback on ventilation volume, stomach inflation, chest compression depth and wrong hand position.